At the last HPS Committee meting we decided on a theme for this year’s Annual exhibition. This e-mail is to give you advance warning so that you are able to think about and produce work for the exhibition over a reasonable timescale!! Yes, we are trying to think strategically!! The theme of this year’s exhibition is ‘Voyager’. 40 years ago, in 1977, NASA launched Voyagers 1 and 2 to explore the solar system and then venture into interplanetary space. 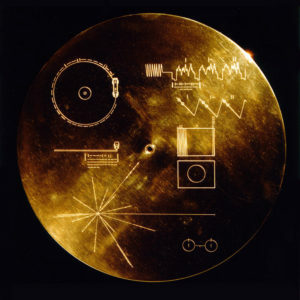 To each of the probes was attached a ‘golden record’ containing a message from earth for any extraterrestrial intelligence that might encounter these messengers. Included was a library of images, encoded in audio format, to give a visual snapshot of our planet and civilisation, a limited glimpse of daily life, the built environment, cultures, landscapes, flora and fauna. 119 images in all. 40 years later what selection of images would we produce to tell the human story in such a limited format? Each HPS member will be asked to submit one image. in both print and PDI format, in each of the following four categories. So four images per member. Two images will be selected for the print exhibition, two for the pdi exhibition. If every member takes part this will result in around 120 images each for the print and pdi exhibition. You will also be asked to provide a couple of sentences per image explaining your choice and what it says about the relevant subject category. We are proposing a submission deadline of the end of June for your 4 images and I would encourage every member to take part in providing work. If you are interested in seeing the Voyager images let me know as I have a book celebrating the 40th anniversary of the launches. Further details in due course but please get back to me with any questions. And enjoy the project!